At the end of 1981, the year that I had shown that cloned poliovirus DNA is infectious, BBC Radio asked me to do an interview about the work. The name of the show was Science Now but I can’t recall who was the host. Whoever he was, he didn’t understand what I had done and got the science all wrong. Listen to the interview below and see if you can spot his errors. For the interview I went to the MIT student radio station where I sat alone behind a wall of glass, with headphones on, before a very large microphone. On the other side of the glass a few disk jockeys were broadcasting a show; the music came through and was picked up by the BBC recorder. 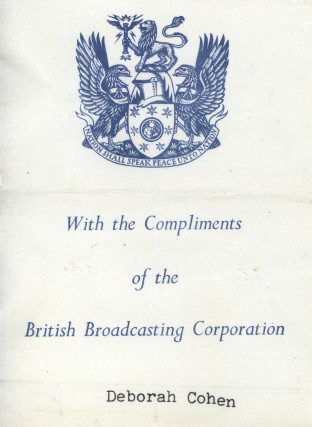 A few weeks after the interview the BBC sent me a tape of the show with a note which read “With the compliments of the British Broadcasting Corporation”. I found the tape recently in a desk drawer and amazingly, the recording was still intact. But I had forgotten how little the radio host knew about viruses. Hi, Vincent, after listening to this, I spotted a few errors. I am not working on RNA virus, please correct me if I am wrong. First, not all RNA viruses have to reverse transcribe their genome. Some RNA viruses's RNA genome can be used directly by host transcription machinery. Secondly, poliovirus does not reverse transcribe during its natural replication cycle. Cloning poliovirus was just because DNA is easier to manipulate than RNA. Lastly, common cold can be caused by many different type of viruses, including both RNA viruses(rhinovirus,Coronavirus, respiratory syncytial virus, etc) and DNA viruses(adenovirus, etc). So not all of them have RNA as their genetic material. If I missed some errors, please add them in. BTW, I am a graduate student working on polyomavirus. I found your TWiV in iTune podcast a few weeks ago, and really enjoy it. It is very informative and interesting! Thanks for making such a wonderful show! First, I'm not a scientist, but a total layman struggling to understand viruses, so please forgive me if I sound completely ignorant! Your work on the poliovirus DNA is amazing. When I listened to the BBC fellow, a few SMALL things struck my LAYMAN'S' mind. 1. He said that viruses' genetic material is in the form of RNA….not all are, aren't some viruses in a DNA form ? 2. They are “borderline between the living and the inanimate”….aren't they non-living, because without a host they cannot survive? 3. He said that viruses multiply by “subverting the host's reproductive system ….the host cell then reproduces according to the virus' instructions and not it's own”……sounds wrong to me. Doesn't the virus particle ,once it has invaded the host cell, then make copies of itself? It's not the host cell that reproduces surely? 4. He said that the virus, in order to be compatible with the host cell, converts itself to a DNA copy of the RNA virus….isn't it the case that the virus makes mRNA which then is interpreted by the host cell……? 5. Last, is it correct to describe your CLONED DNA POLIOVIRUS as a “novel infectious organism” ? Like I said, and as is obvious from my post, I'm a complete layman…so I beg your forgiveness for my ignorance. I could be talking nonsense but my intentions are good….i.e. understanding science! I need a textbook that would precede your Virology 101…. I am fairly sure that the Science Now host who interviewed you was Dr Geoff Watts FMedSci, he is a freelance science and medical writer and broadcaster. Thanks, Peter. We just got to reading your email about this on TWiV, coming out on 8/10/14.